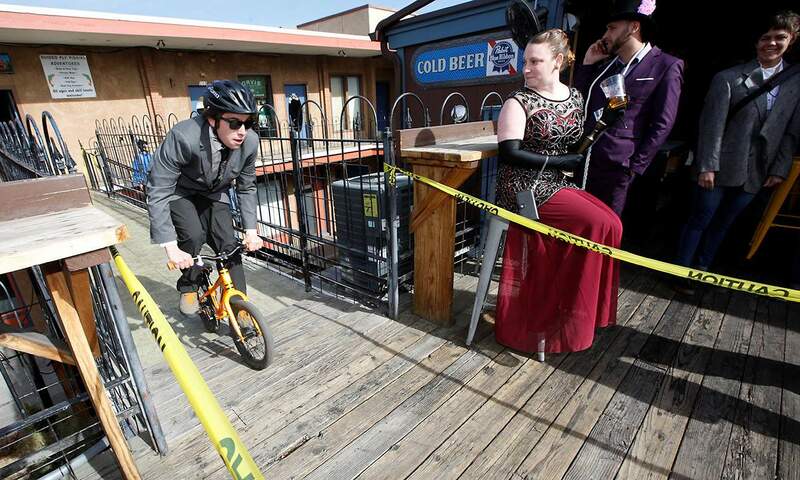 Blake L. makes his way around the balcony during the Snowdown 2018 Big Wheel Derby on Thursday at the Balcony Bar & Grill. Big Wheel DerbyIt was rowdy fun at the Big Wheel Derby at Balcony Bar & Grill, where 20 contestants had to chug a beer before racing a timed lap around the balcony on a kiddie bicycle. Surprisingly, only one person got sick after chugging his beer. The winner’s time was 00:26:20, about two seconds faster than second place. Most Elegant Hot Wing Eating ContestIt was all sweat and tears during the Most Elegant Hot Wing Eating Contest at Animas City Theatre. Fifteen brave contestants consumed a total of about 200 wings doused in a sauce hotter than any on the menu at Cuckoo’s Chicken House. The competition was fierce and lasted longer than any previous year. While many admitted defeat, Mark Mitchell was crowned the champion after Round 18. Following a ceremonial round, Mitchell had eaten 19 hot wings. Iron MixologistLike Chopped on the Food Network channel but with alcohol, the Iron Mixologist competition at El Moro Spirits & Tavern attracted 16 competitors who faced off against one another to prepare delicious cocktails for three judges. The contestants were given a mystery ingredient every round that they could mix with an assortment of other alcohols, syrups and garnishes to create three drinks in 5 minutes or less. The mystery ingredients were Träkál, black strap rum, Fernet-Branca, Montanya Distillers rum and Amer dit Picon from Golden Moon Distillery. Ryan Cleveland bested the competition to win the coveted Golden Bar Spoon and a $75 El Moro gift card. For more Snowdown photos and coverage, visit The Durango Herald’s Snowdown page at www.durangoherald.com/snowdown.